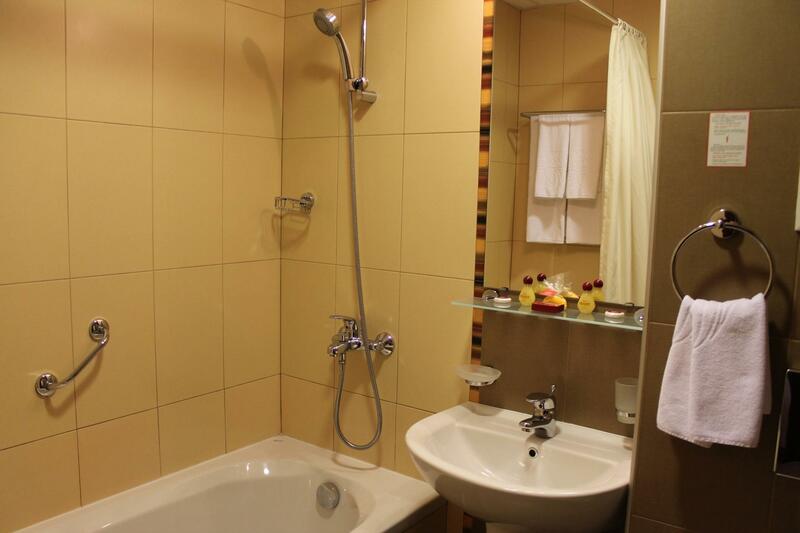 Spacious rooms with a large bedroom suite, each with a separate balcony and bathtub in the bathroom. 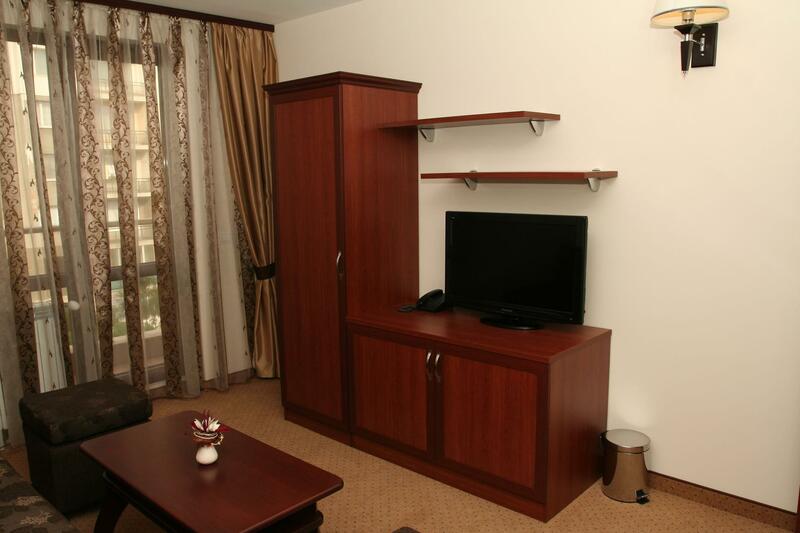 All are equipped and furnished in such a way as to easily become your FAVORITE rooms. 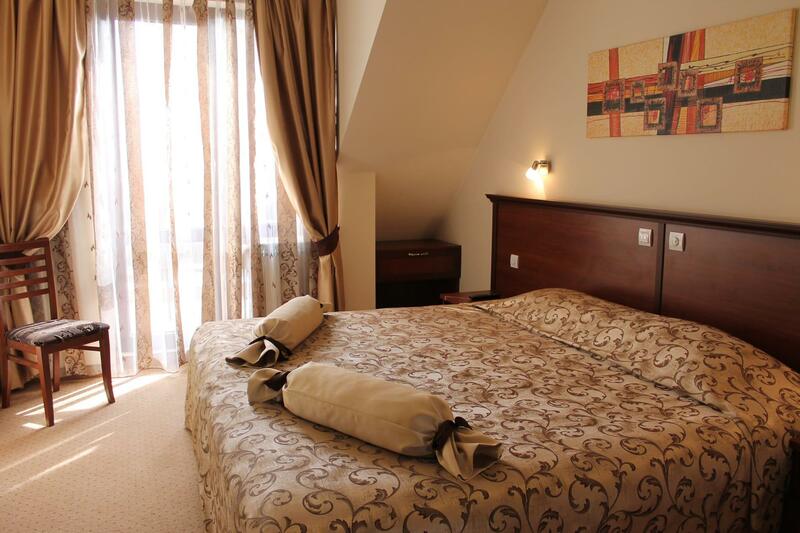 Stylish classic rooms with double bed, all with their own balcony. 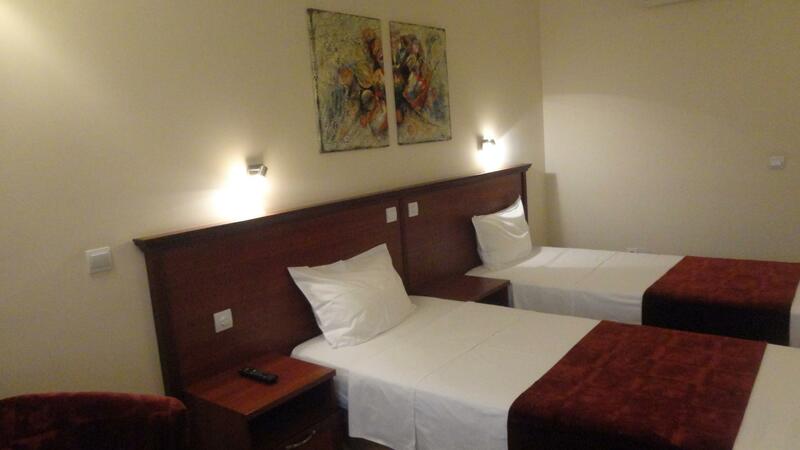 Rooms appropriate for accommodation of two persons on two separate beds. 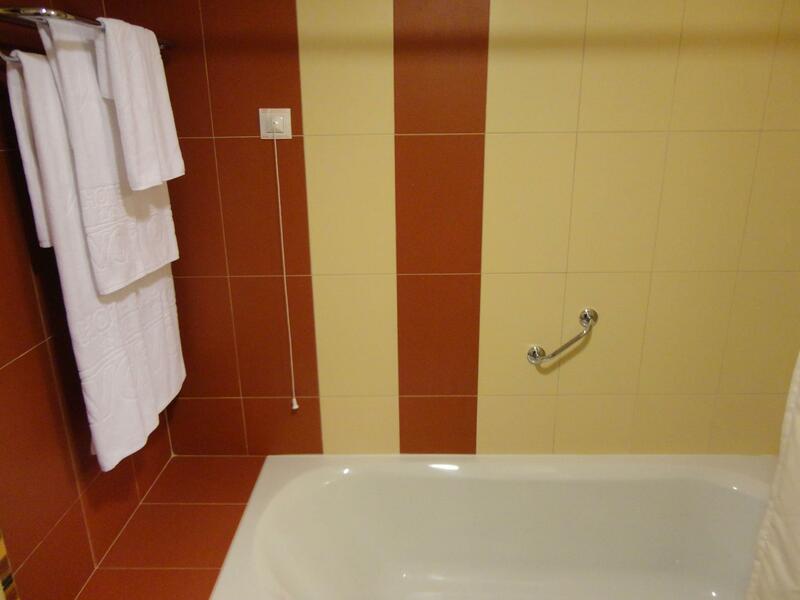 These rooms have a bathroom with a bathtub. 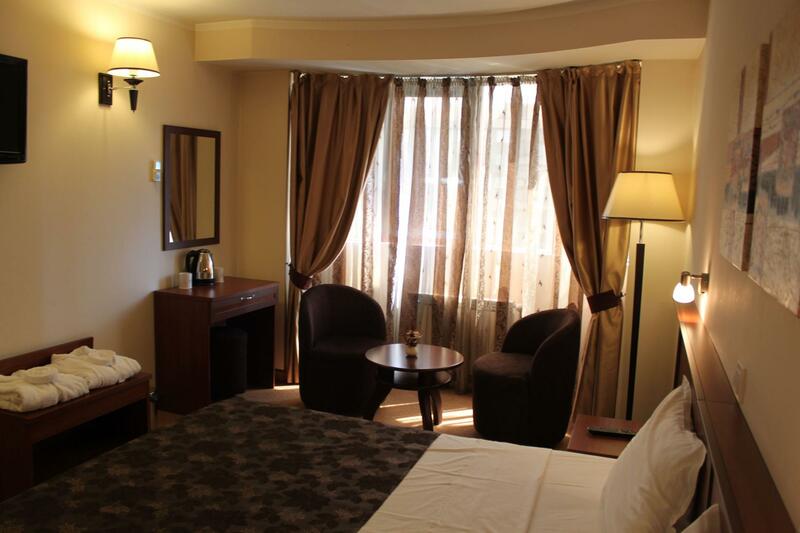 Well-lit, artistic and cozy, this is the suite which will meet your expectations of peace and harmony. 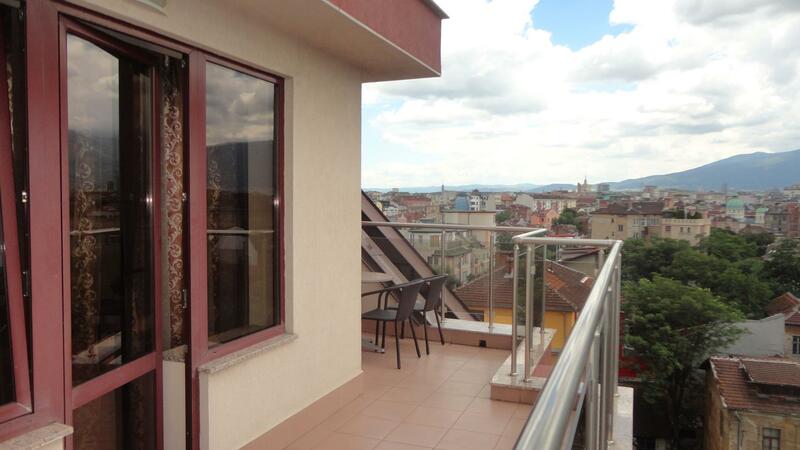 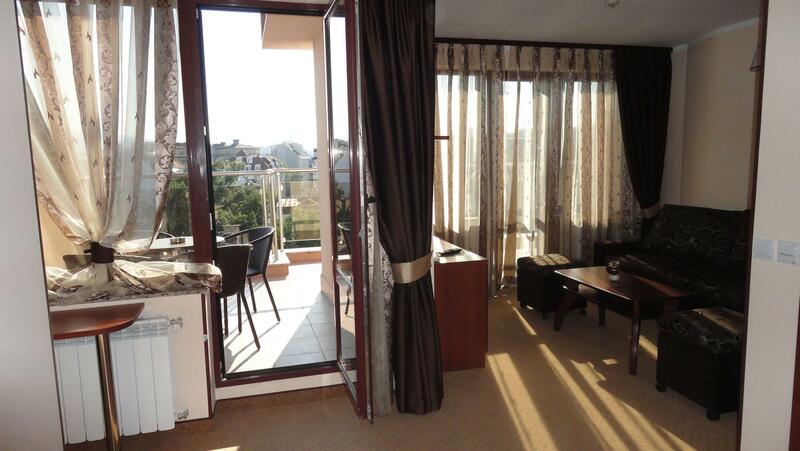 This suite has a double bed, shower cabin and a large terrace with city view. 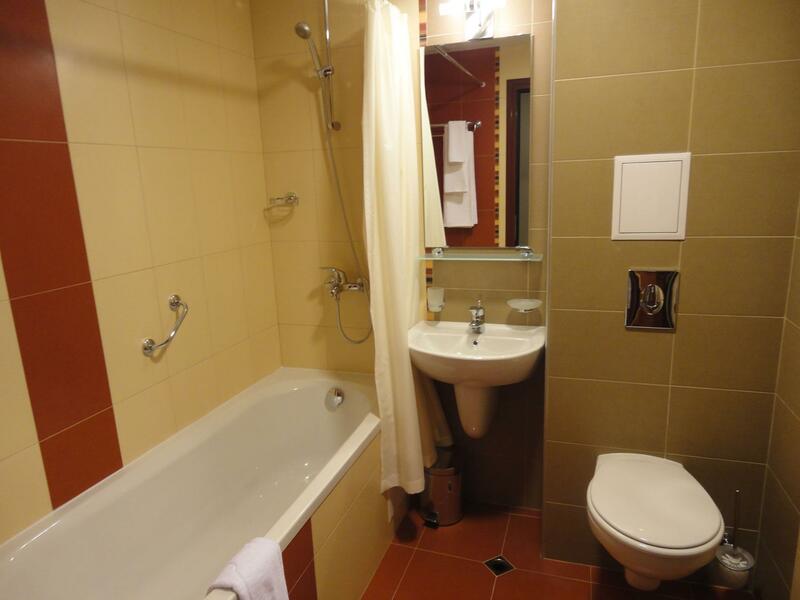 Two functional suites with twin beds on the fifth and sixth floor, with a bathtub in the bathroom and a small balcony. 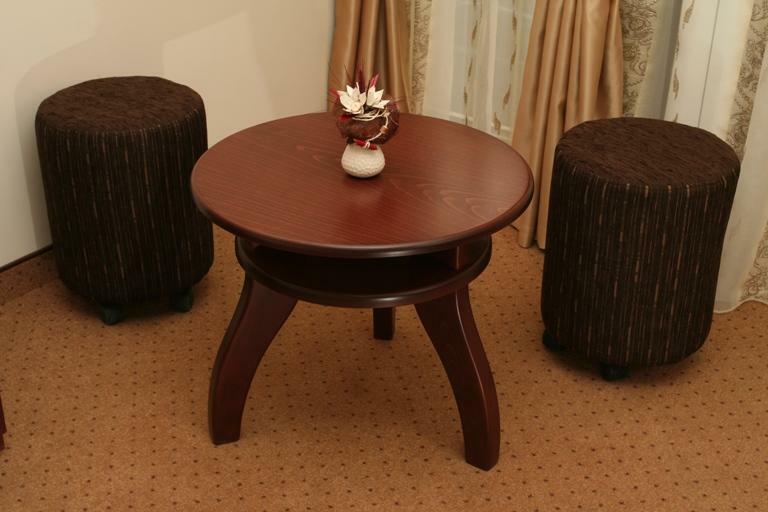 Ideal for long stay accommodation of colleagues or friends. 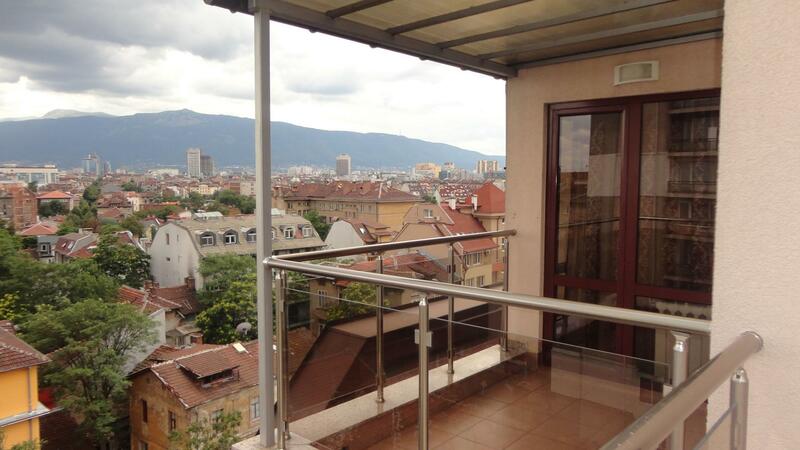 The sole suite on the top floor, with spacious panoramic terraces that provide a spectacular view of Sofia and Vitosha mountain. 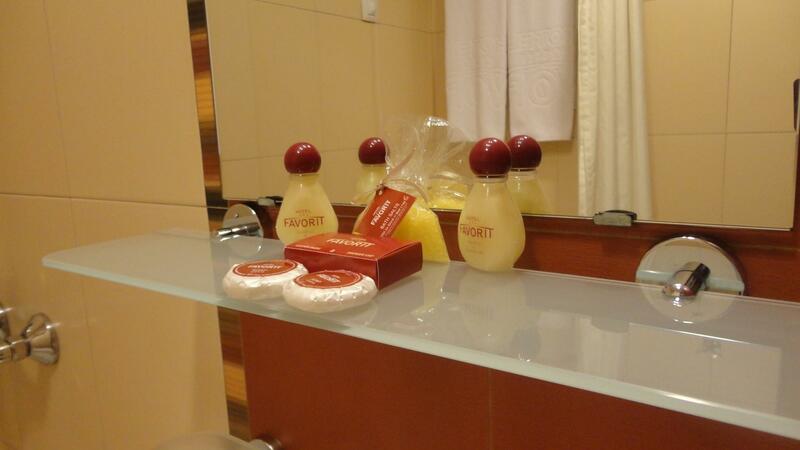 Suitable for special occasions. 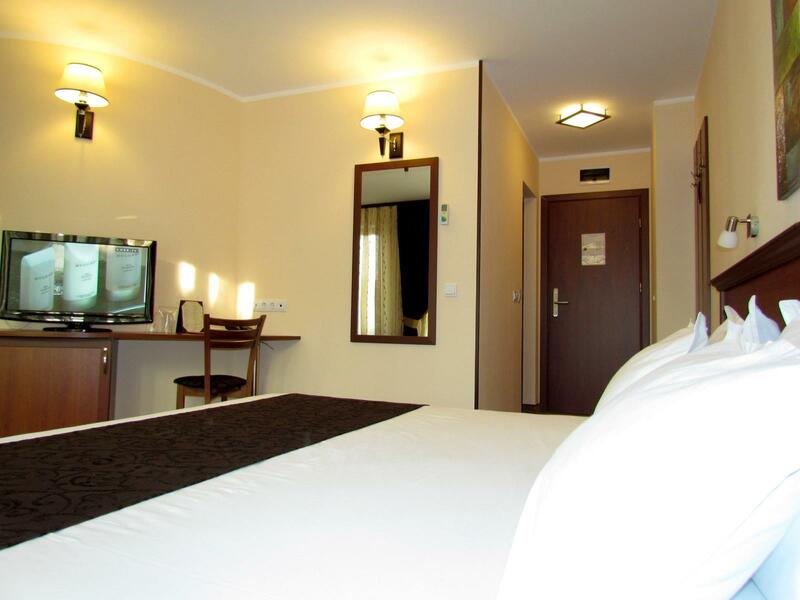 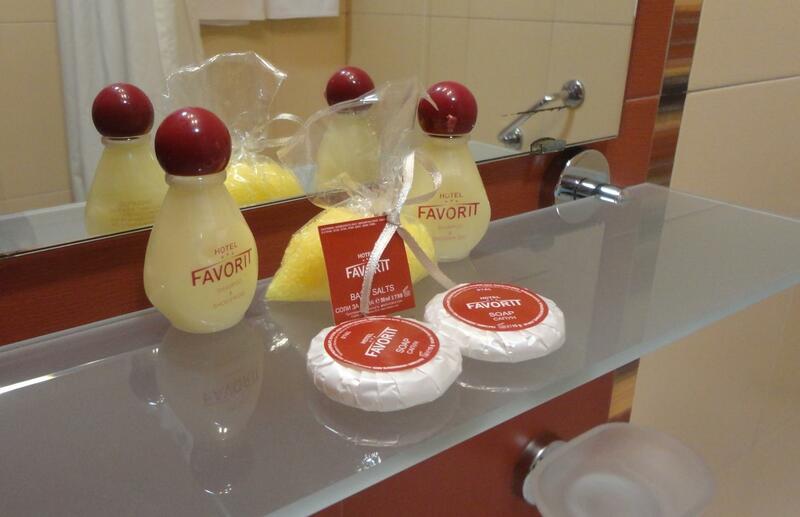 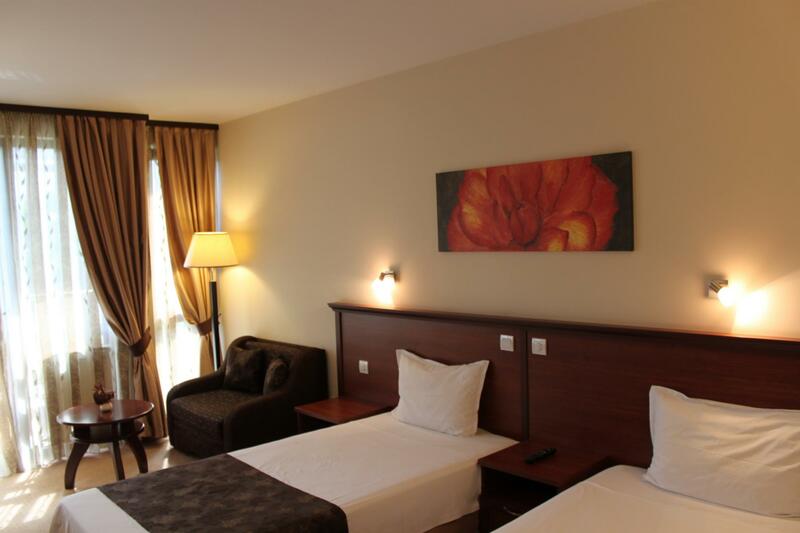 The atmosphere in Hotel Favorit is warm and cozy, the rooms and suites are comfortably and elegantly furnished and they guarantee you total relax. 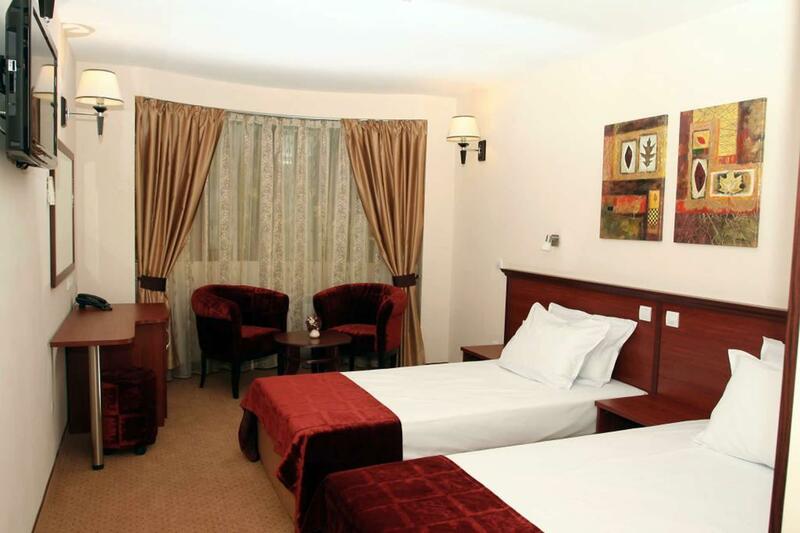 We have 16 Standard double rooms, 4 Deluxe rooms (Favorit) and 5 Suites furnished so as to satisfy any requirements and preferences of our guests. 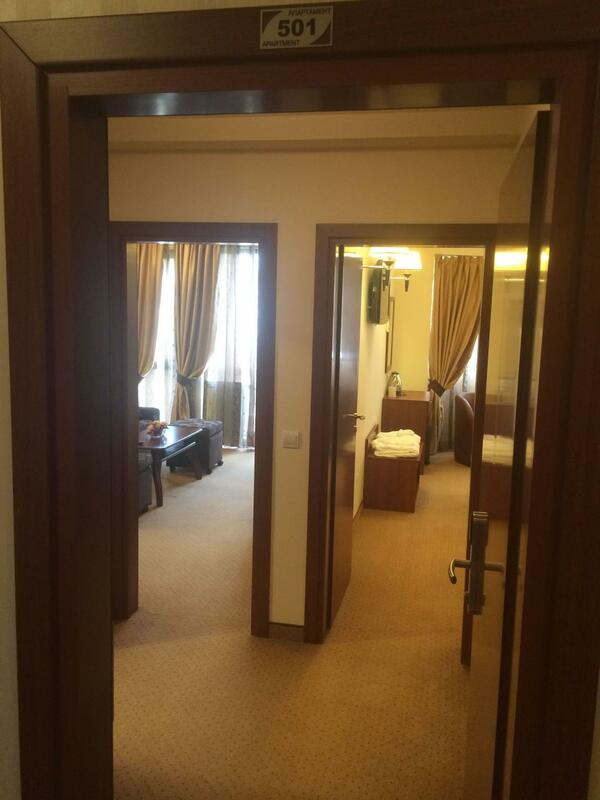 All the rooms are for non-smokers. 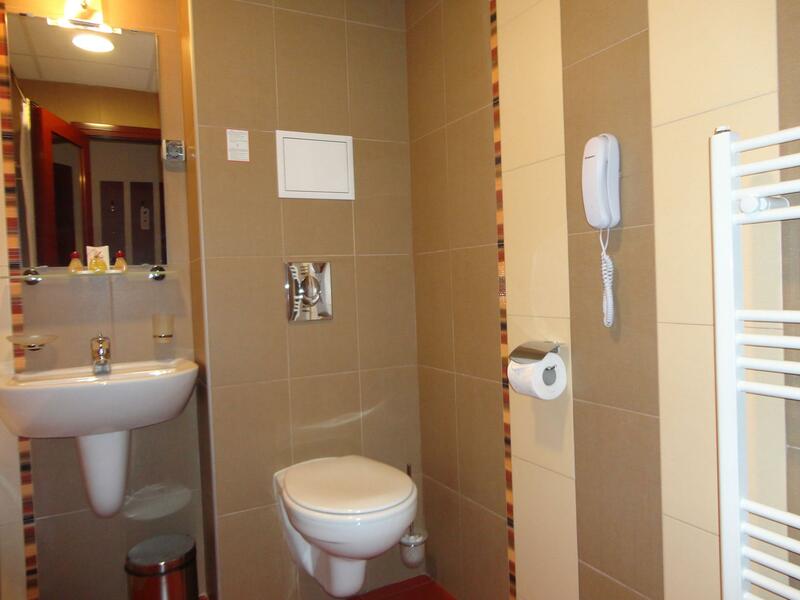 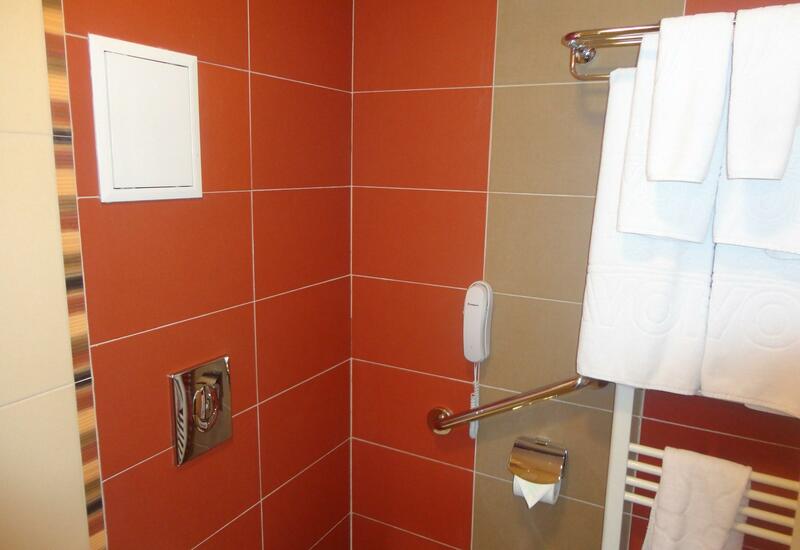 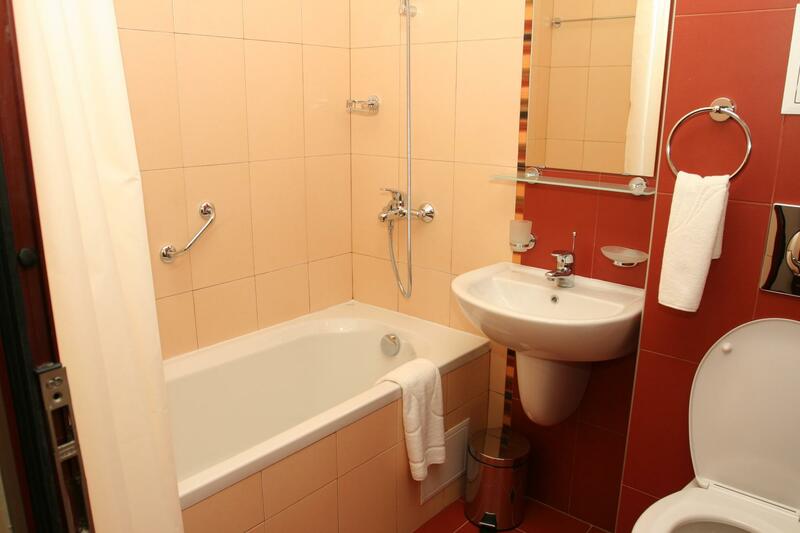 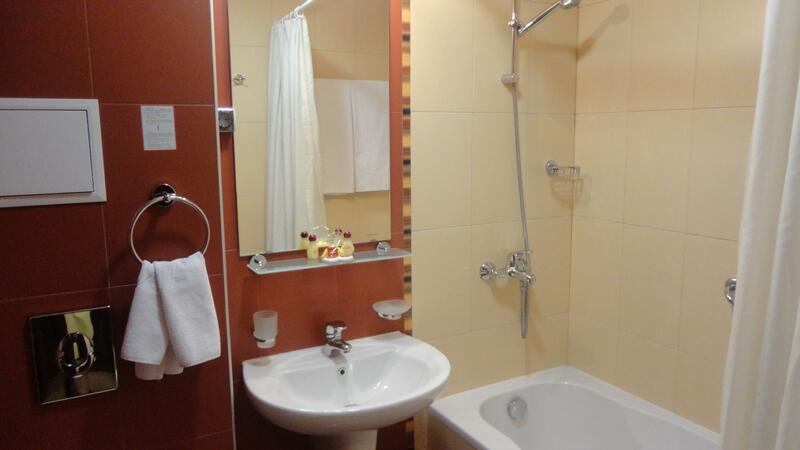 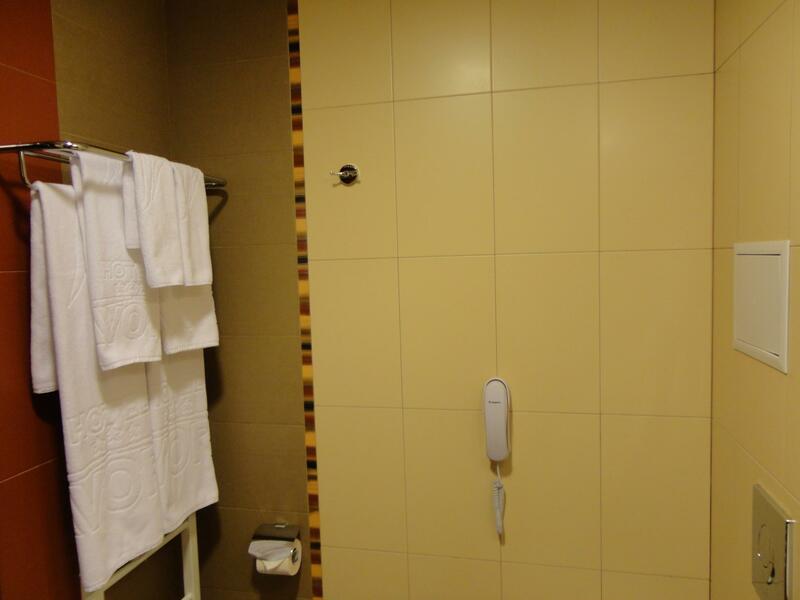 In every room there is a separate bathroom which comes with towels and toileteries. 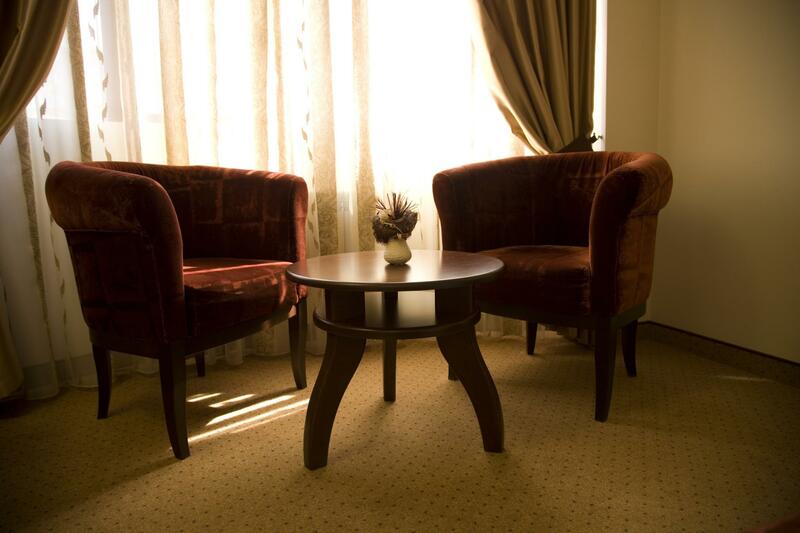 The floor is covered by fireproof carpet and the curtains are with black-out coating. 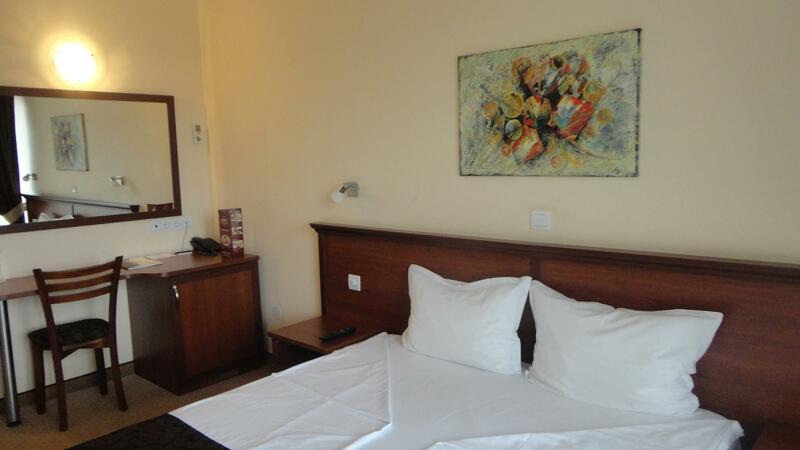 The beds are comfy, with anatomic mattresses with memory foam. 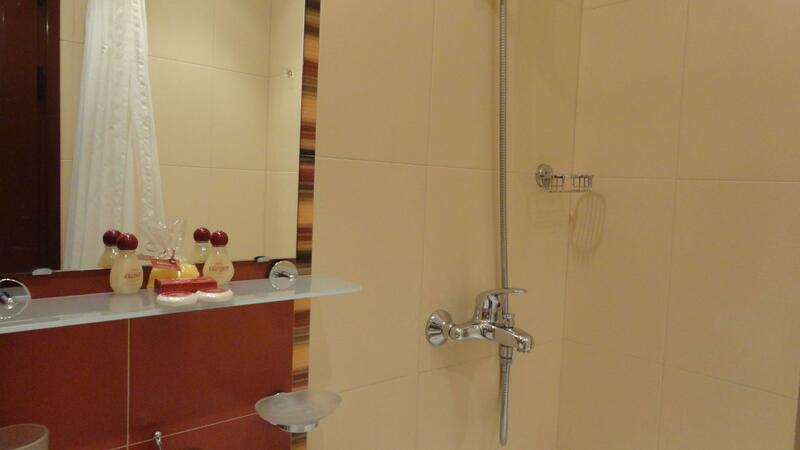 In some Standard rooms and in all Deluxe rooms and Suites there is a direct telephone line. 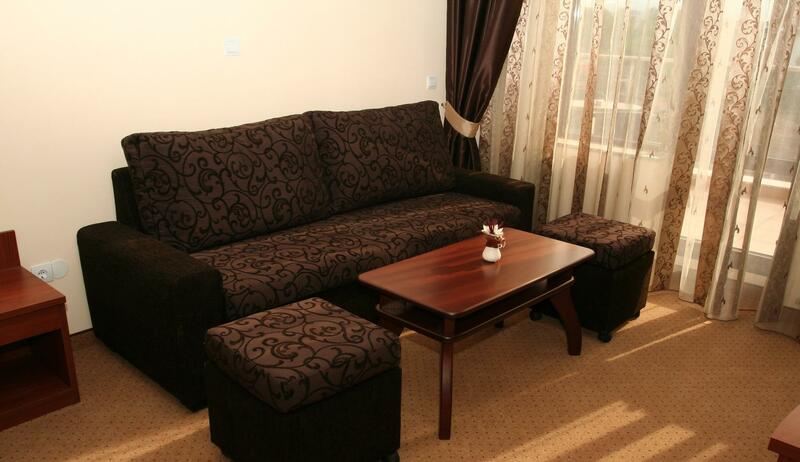 All suites are furnished with a sofa-bed which can be used as an additional bed. 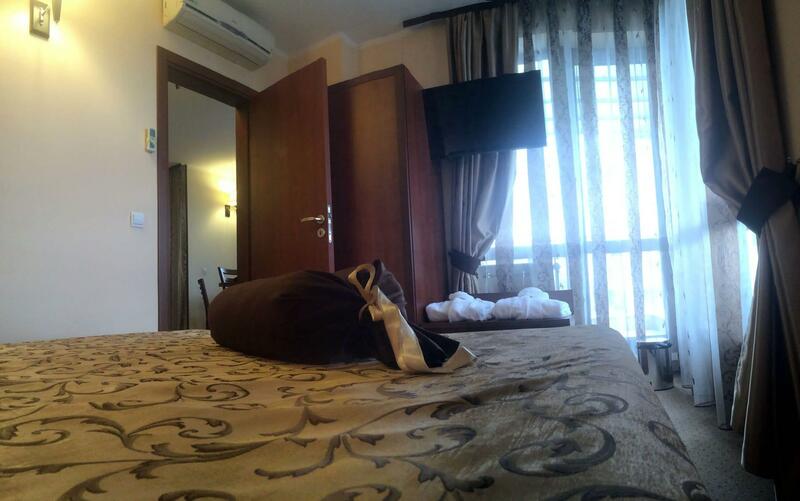 Cozy and practical, this type of rooms are furnished and fitted with divinely comfortable double bed with memory foam mattress, and with luxurious, sun-blocking curtains which will guarantee your total relax and sound sleep. 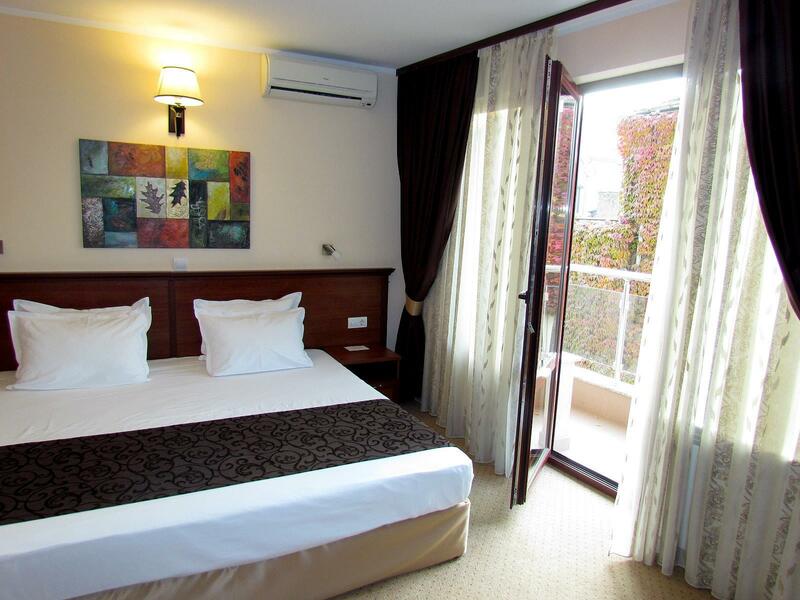 At your disposal you have your own balcony and all classic facilities such as LCD TV set, digital TV, Internet connection free of charge – Wi-Fi & cable, telephones in the room and in the bathroom, air-conditioning, mini bar, work desk and electronic door locking system. 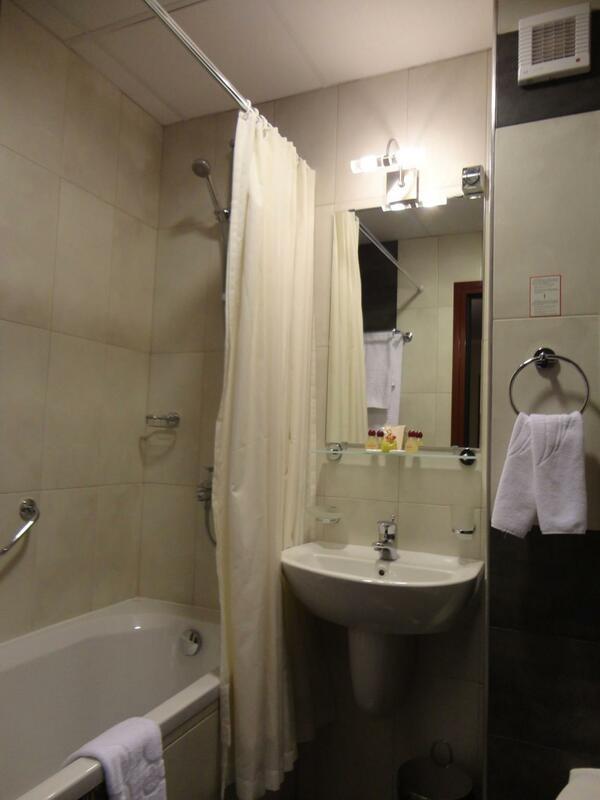 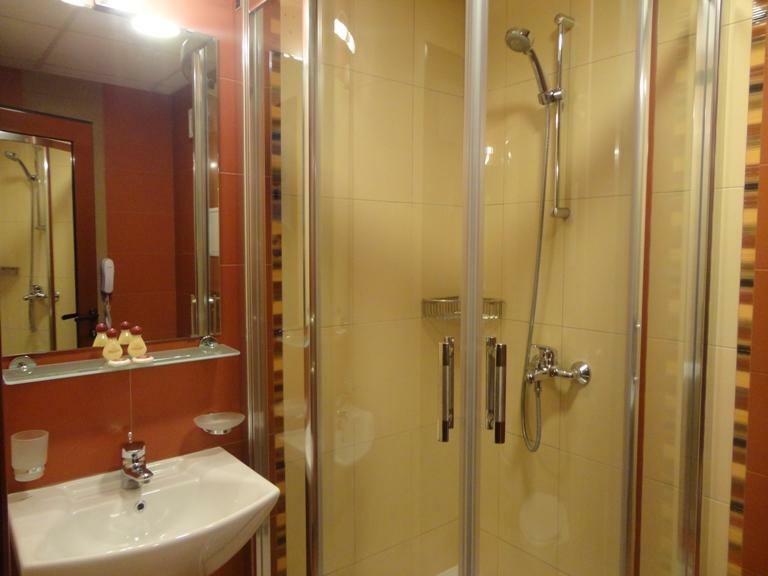 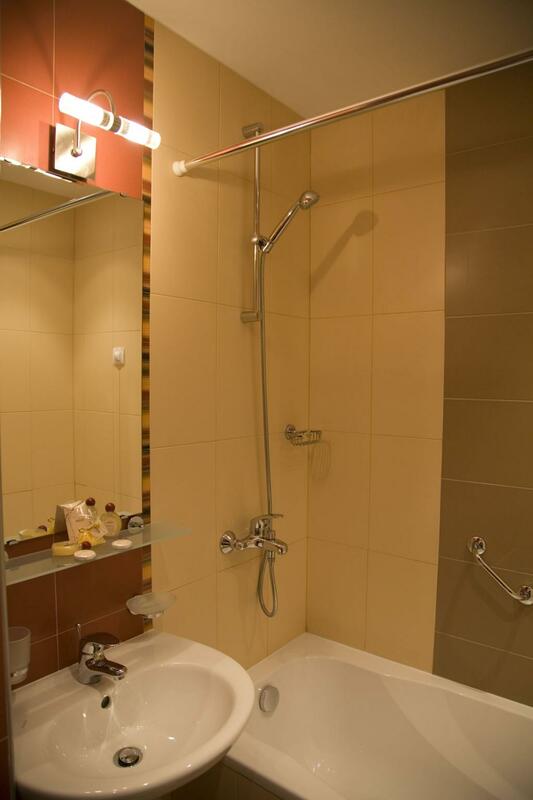 Depending on your preferences, there are different bathroom options – bathtub or shower cabin. 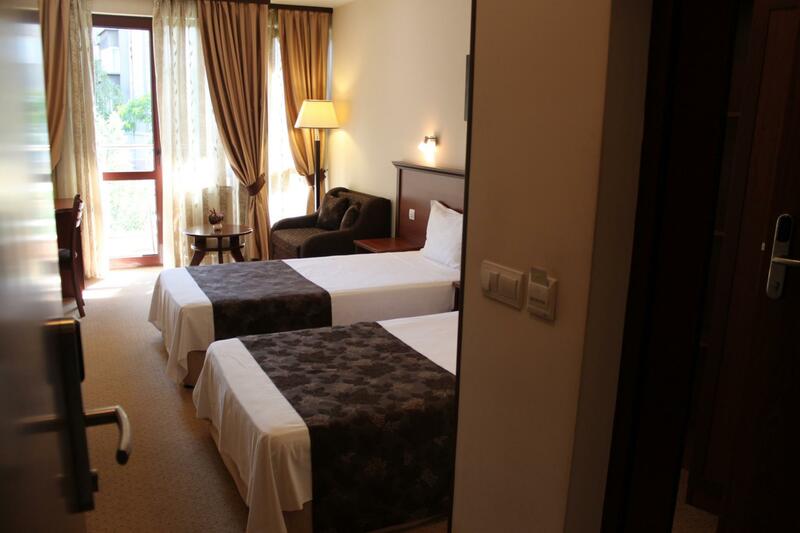 Elegant and comfortable, this room with twin beds will charm you with its style and cozy home feel. 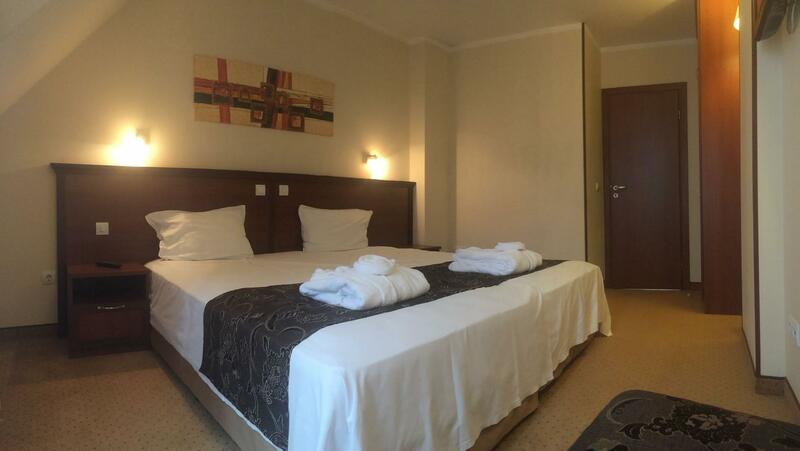 Sleeping on our comfortable beds with memory foam mattresses is a real pleasure! 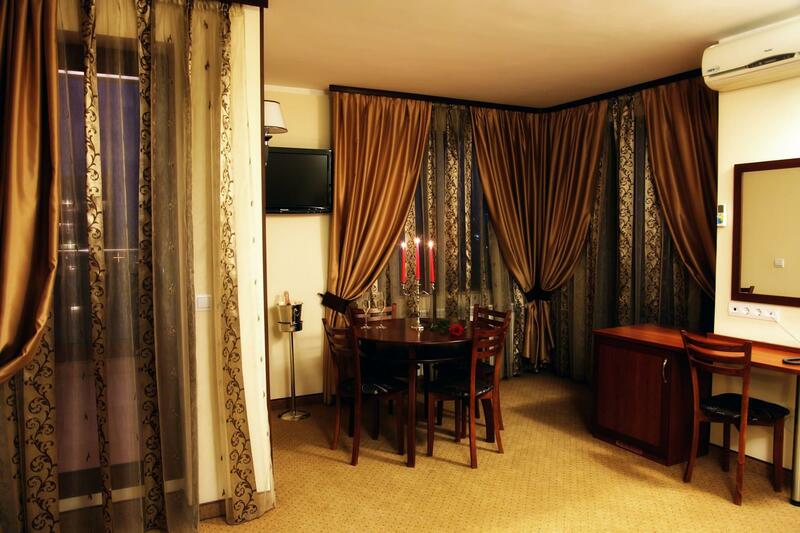 And for a lovely evening you can lean back and relax on the sitting area, indulging yourself with a drink from our well-stocked mini bar. 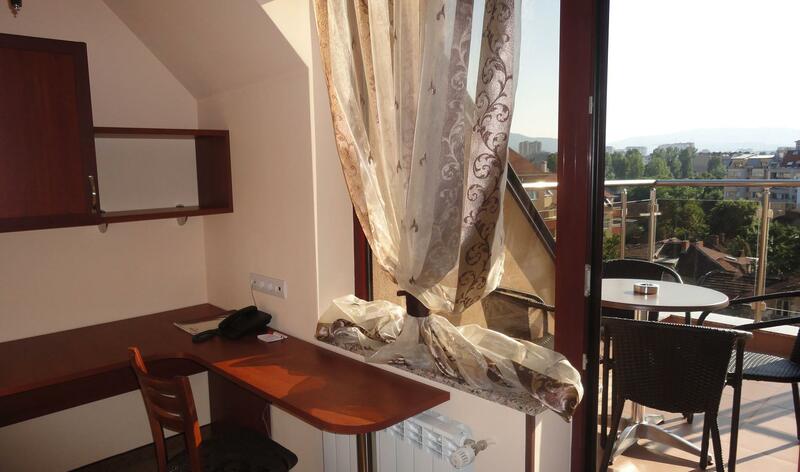 In some of the rooms there is a balcony. 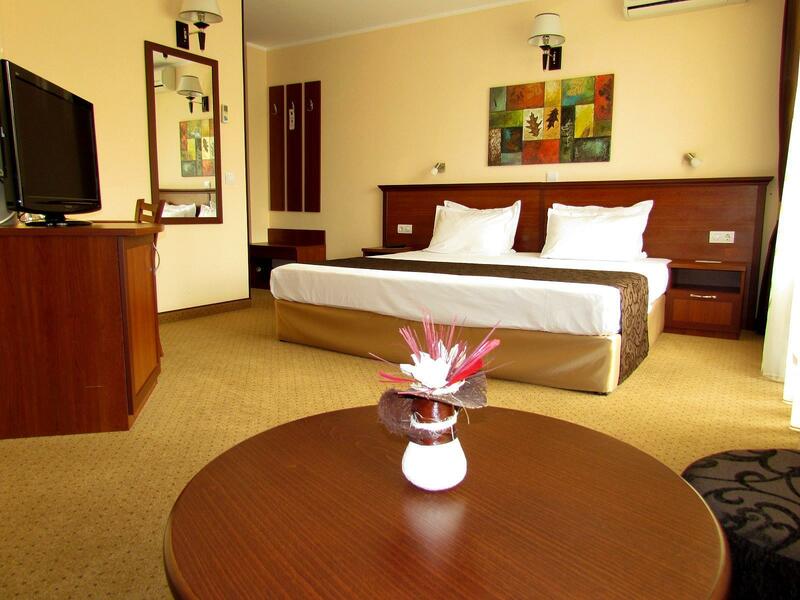 In addition to the relaxing environment, you can enjoy amenities such as LCD TV set, digital TV, Internet connection – Wi-Fi & cable, telephones in the room and in the bathroom, air-conditioning, work desk and electronic door locking system. 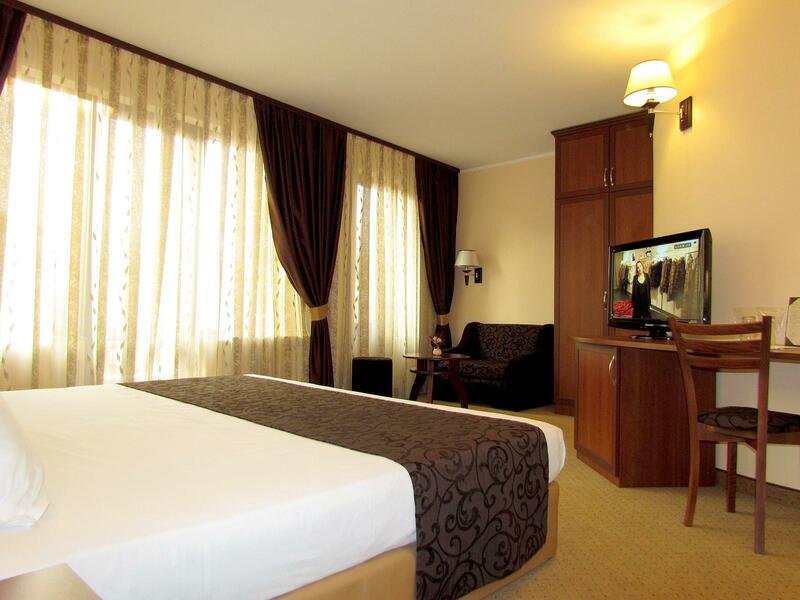 Comfortable and artistic, this room is perfect for your family. 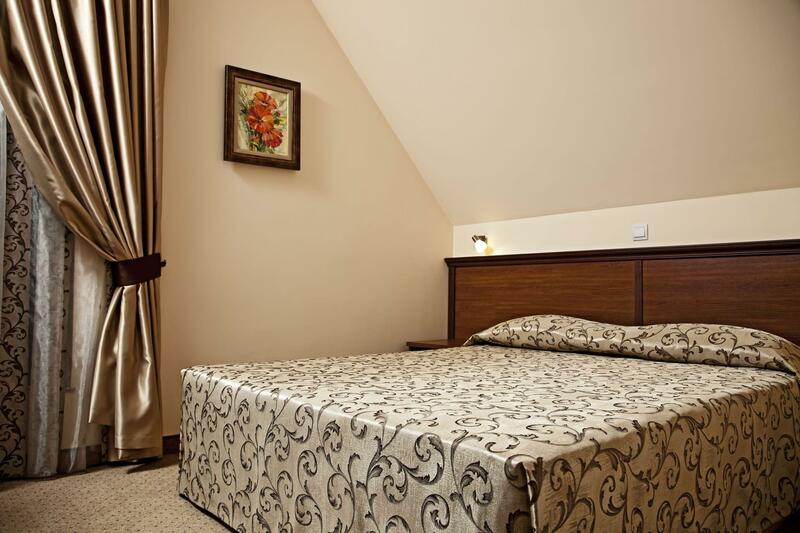 A high-quality memory foam mattress and a king-size bed will guarantee your sound sleep and relaxation. 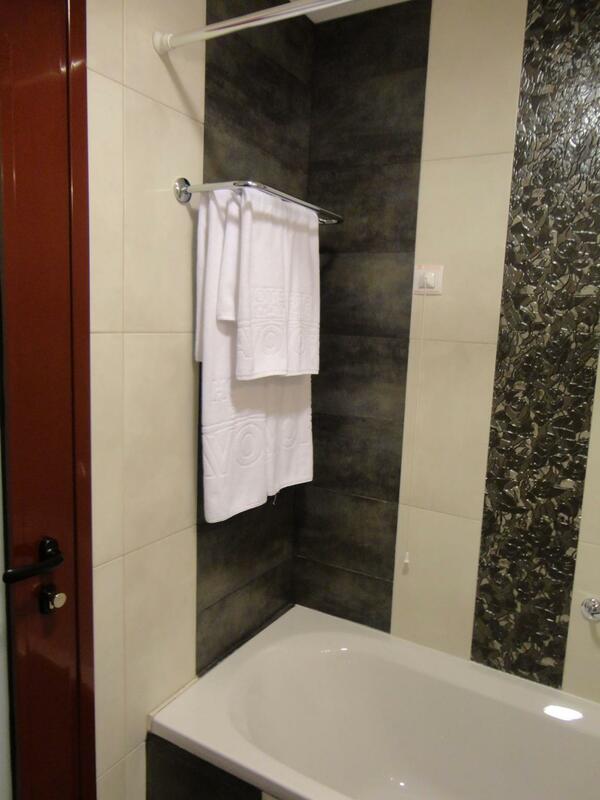 You will also have your own balcony and you can enjoy a hot tub with bath salts. 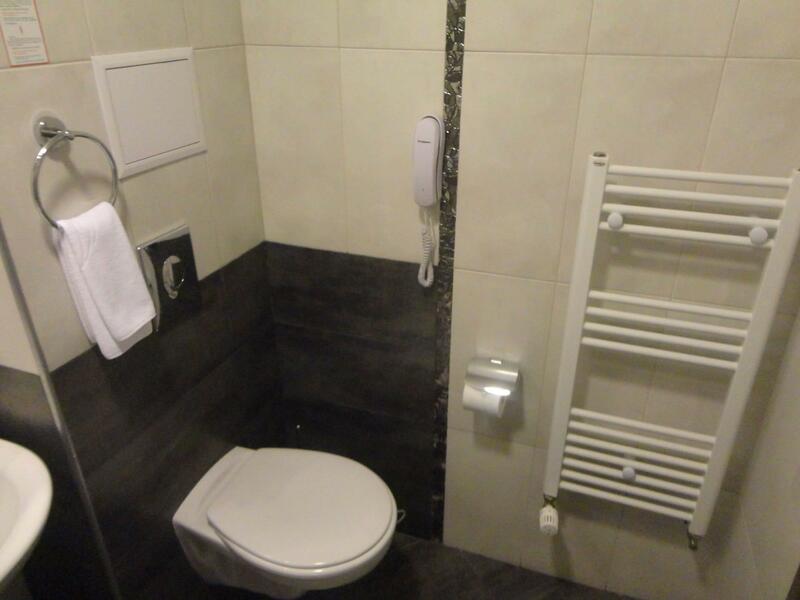 Of course, we have not forgotten the facilities which a modern person cannot do without – LCD TV set, digital TV, Internet – Wi-Fi & LAN, telephones in the room and in the bathroom with a direct telephone line, air-conditioning with individual temperature settings, mini bar, work desk and electronic door locking system. 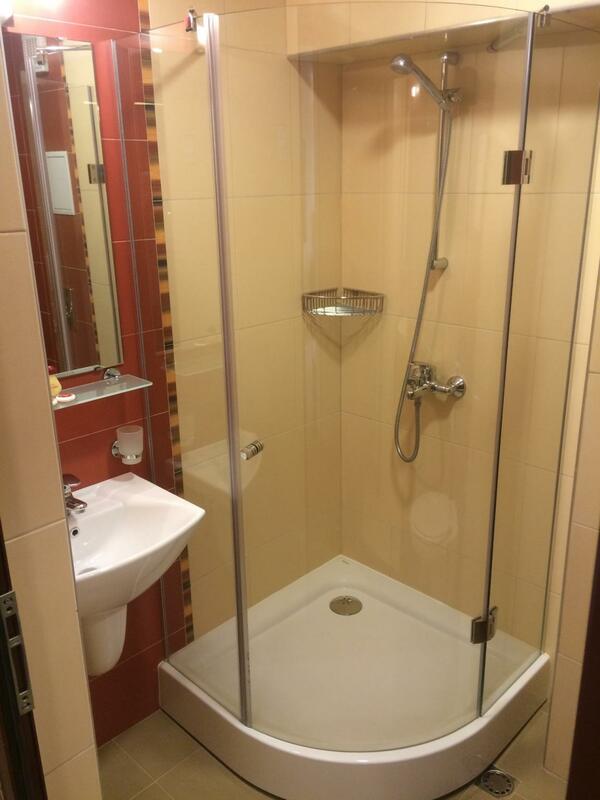 The COMFORT suites are practically furnished and equipped. 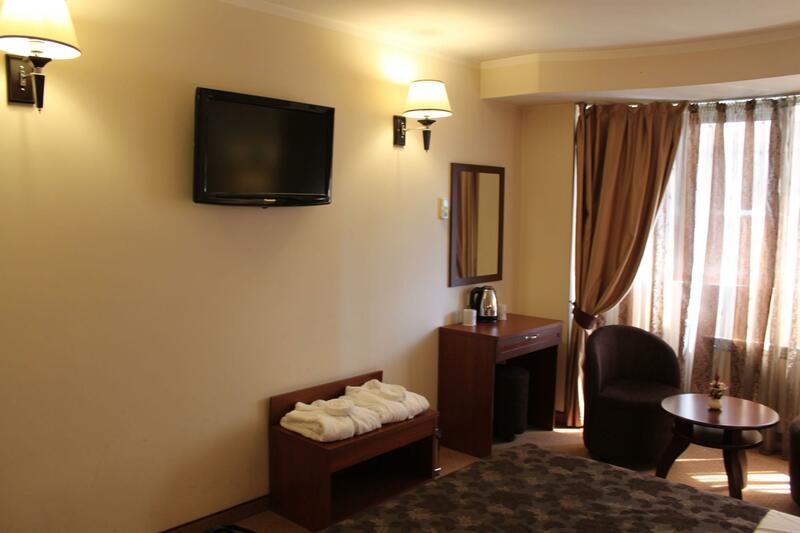 The TWIN BEDS in the spacious bedroom have incredibly comfortable mattresses with memory foam and there is also a LCD TV set, а dressing table with a large mirror and a separate space with comfortable armchairs and a small table. 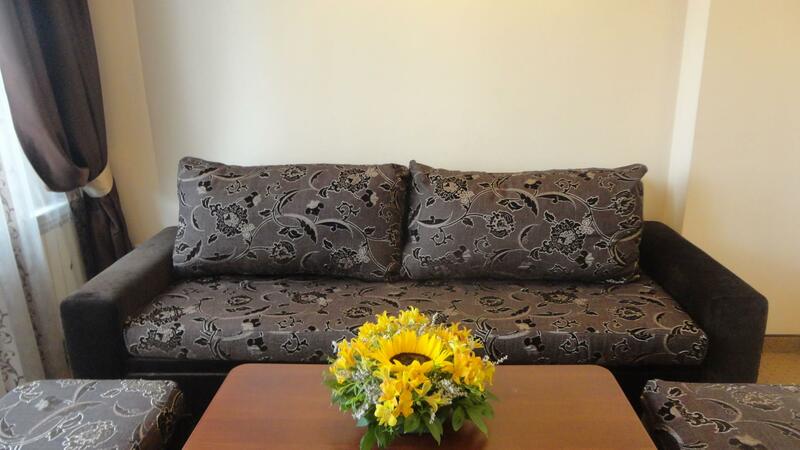 In the living room there is a well-stocked mini-bar, small table, cupboard and shelves, LCD TV set and sofa bed which can be used by two children or one adult. 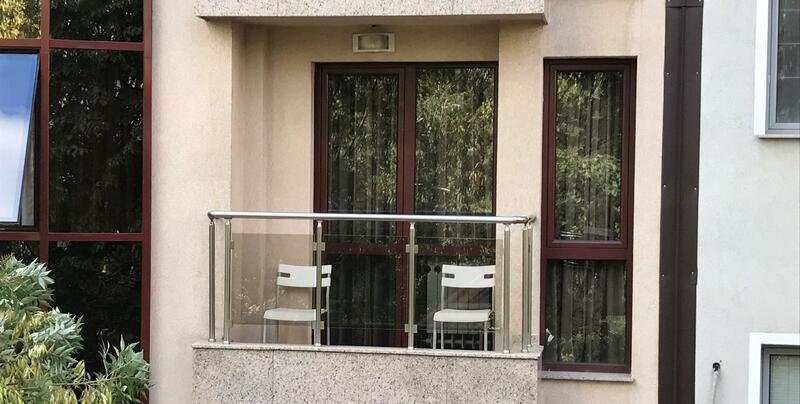 There is a separate small balcony outside the living room. 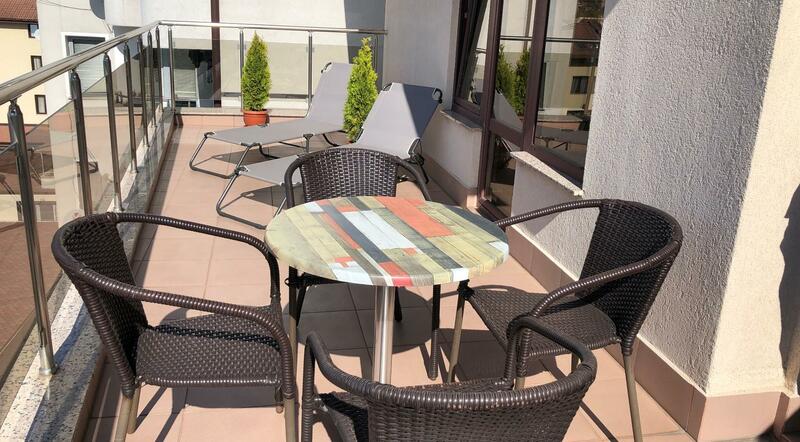 These suites are situated on the quiet and bright 5th and 6th floors which makes them ideal for long stay accommodation of colleagues or friends. 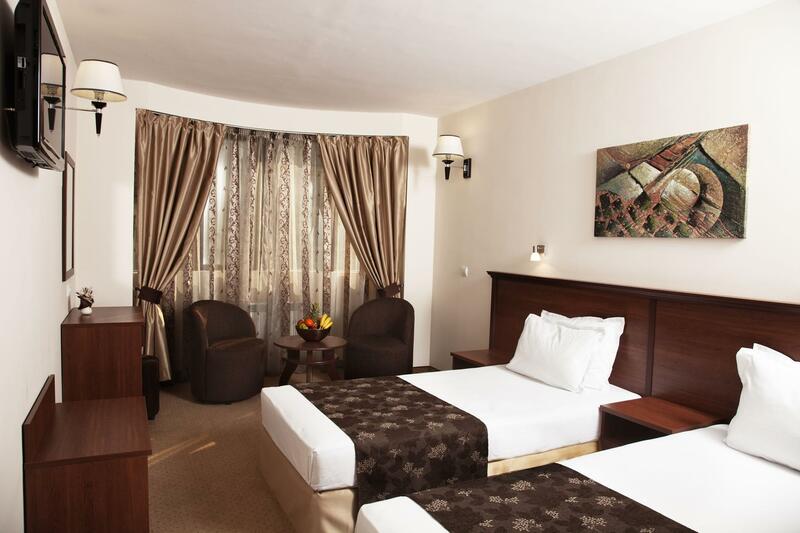 Well-lit, artistic and cozy, suite Harmony which will satisfy your expectations of peace and harmony. 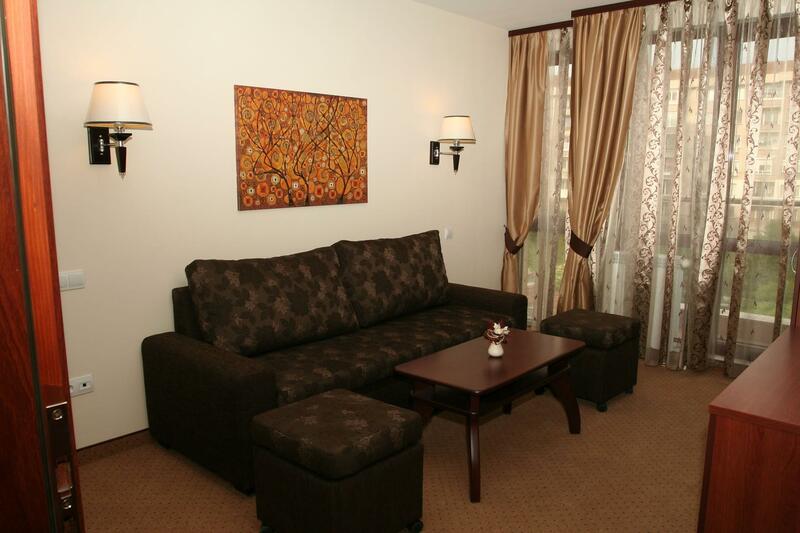 Here you can feel at home, relax on the sofa in the living room or enjoy a resplendishing rest. 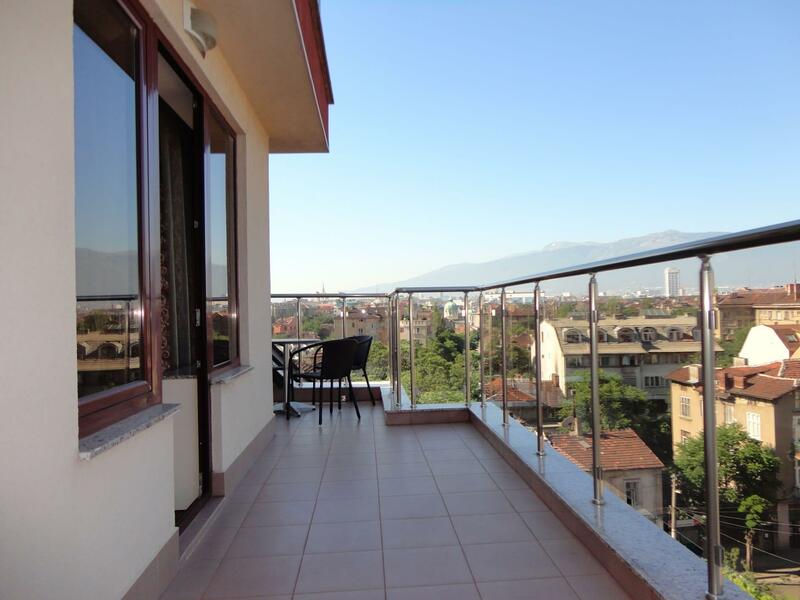 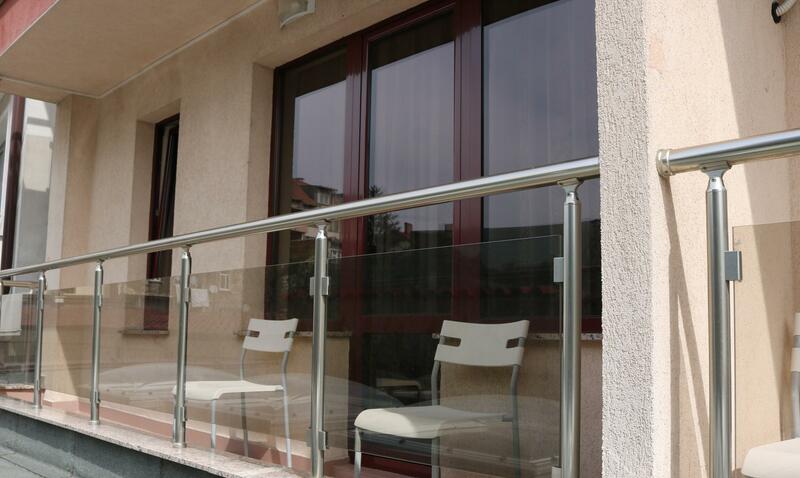 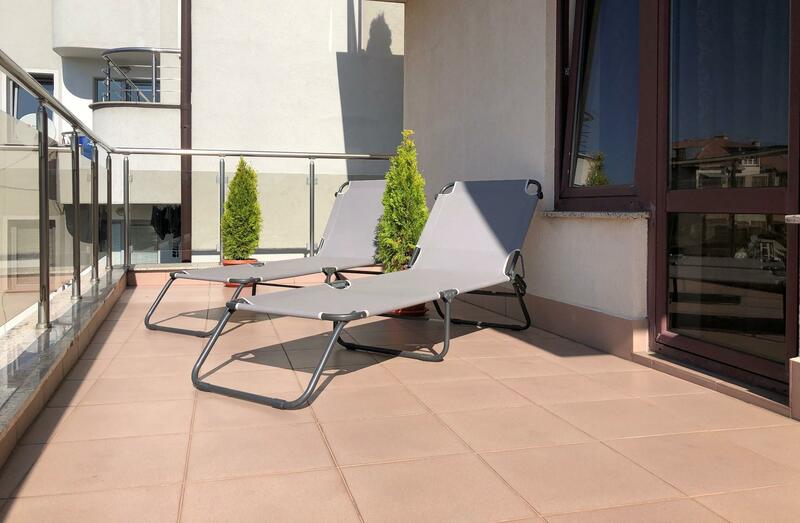 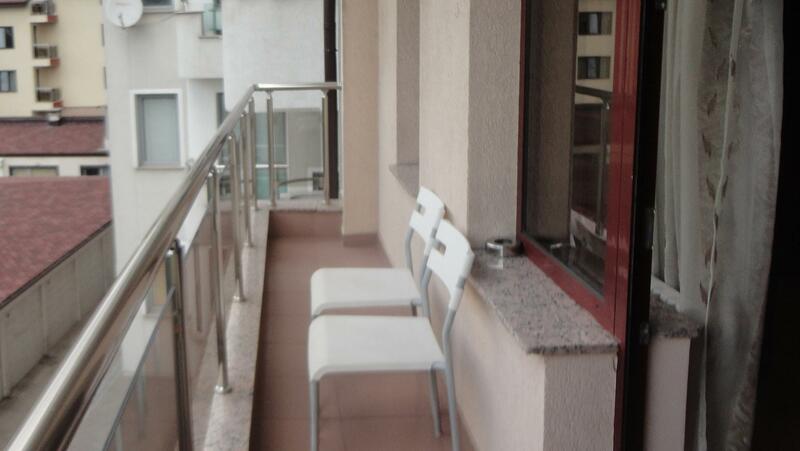 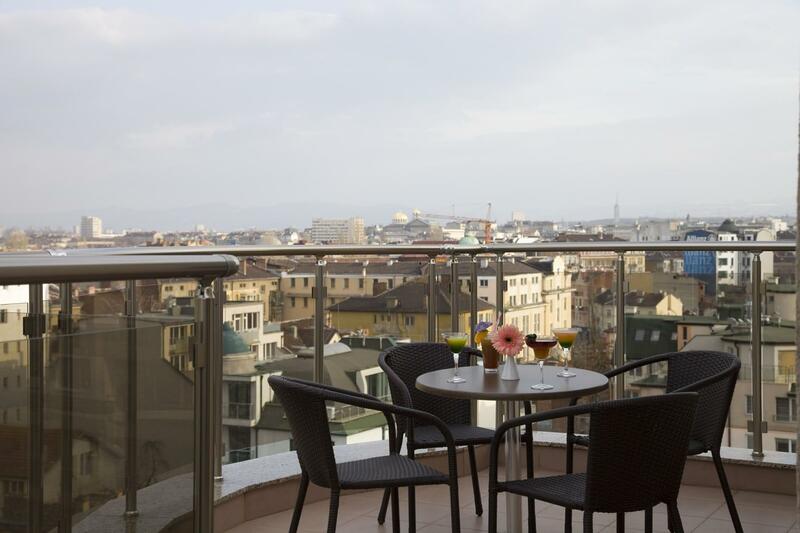 On the spacious balcony, with a cup of hot coffee or an evening drink, you can admire the view of Sofia and Vitosha mountain. 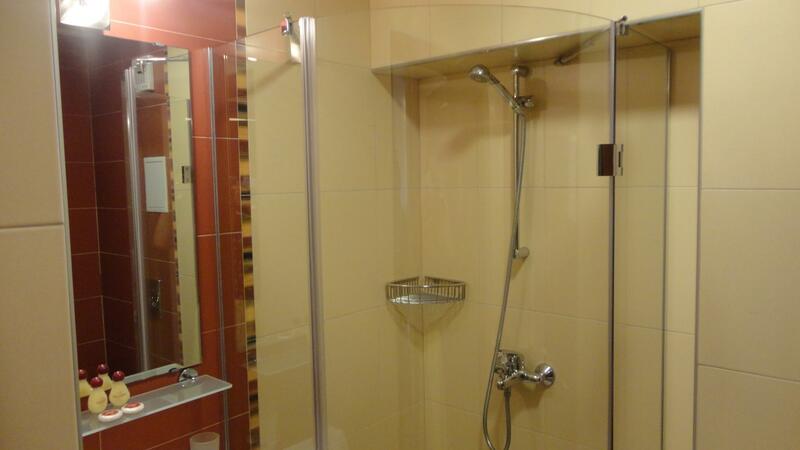 The bedroom comes with a double and a shower cabin in the bathroom. 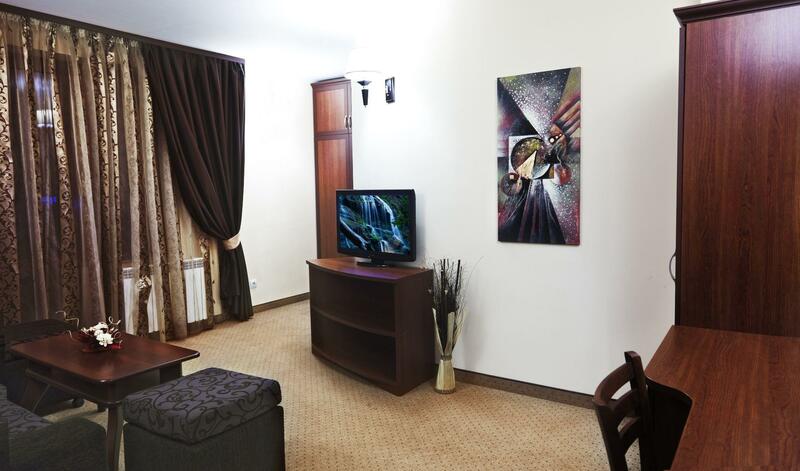 For your convenience, there are two TV sets in the suite – one in the bedroom and one in the living room, two wardrobes, a TV cabinet and a mini bar, as well as a direct telephone line, Internet connection, air-conditioning and electronic locking system on the entrance door. 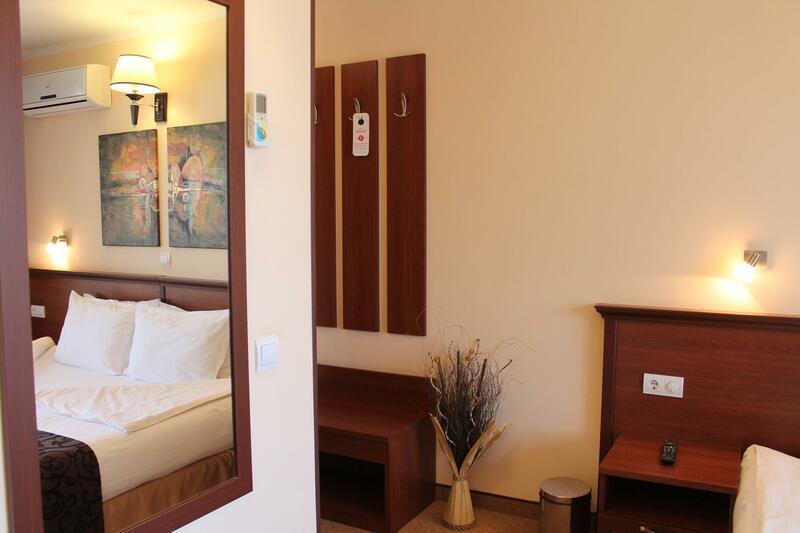 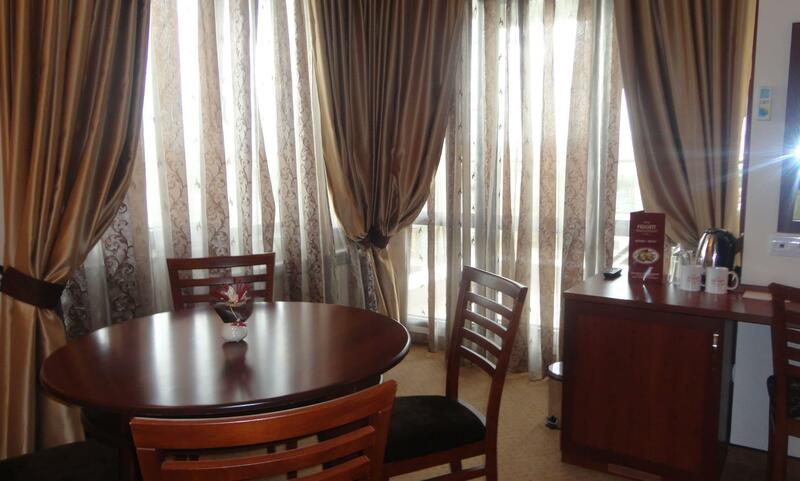 This suite is especially attractive for long stay guests and business tourists. 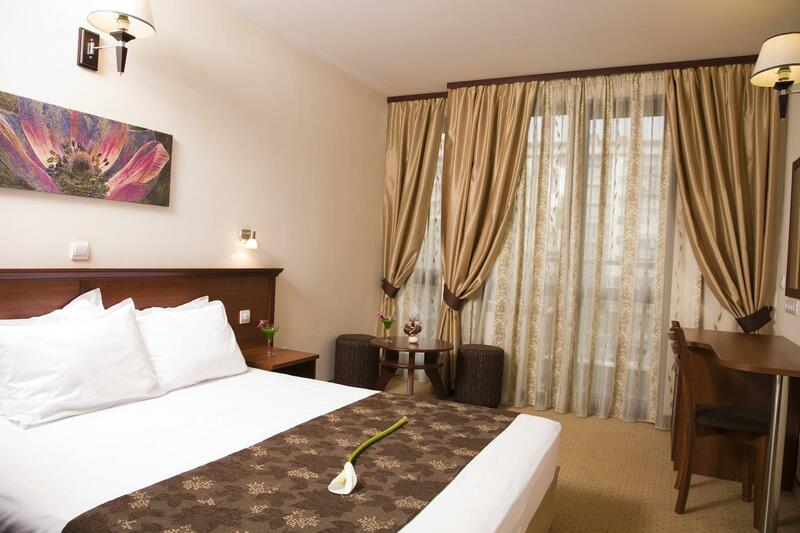 At your disposal you have a bedroom with king-size bed and a living room in soft hues, furnished stylishly and conveniently. 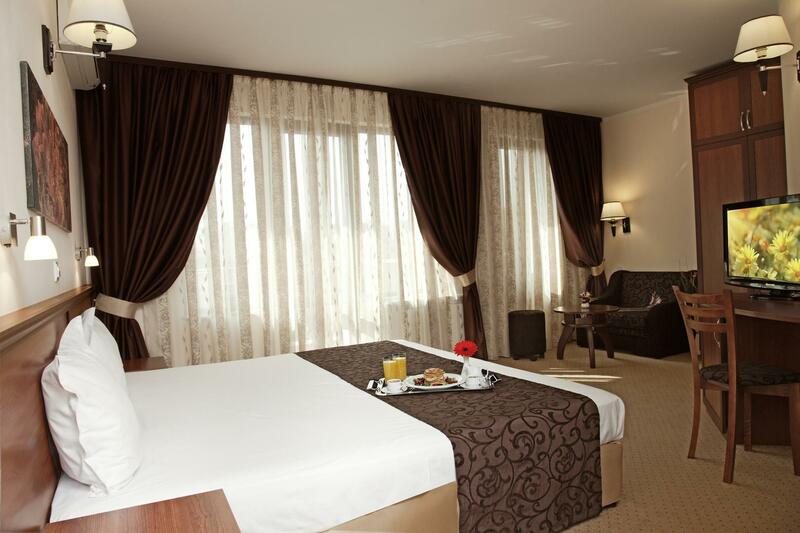 The comfortable bed in the bedroom and the black-out curtains will guarantee you total relaxation. 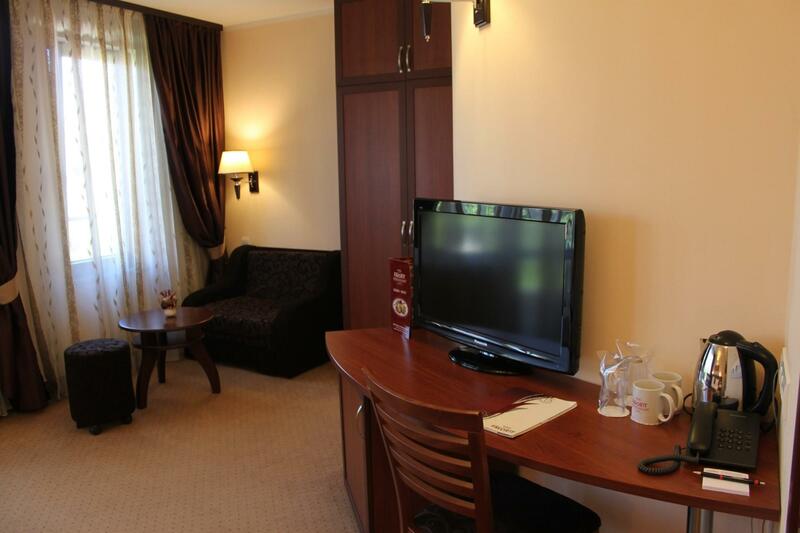 In the living room there is a sofa bed with a small table, mini bar, TV cabinet, wardrobe and special separate workspace with a direct telephone line and Wi-Fi & cable Internet. 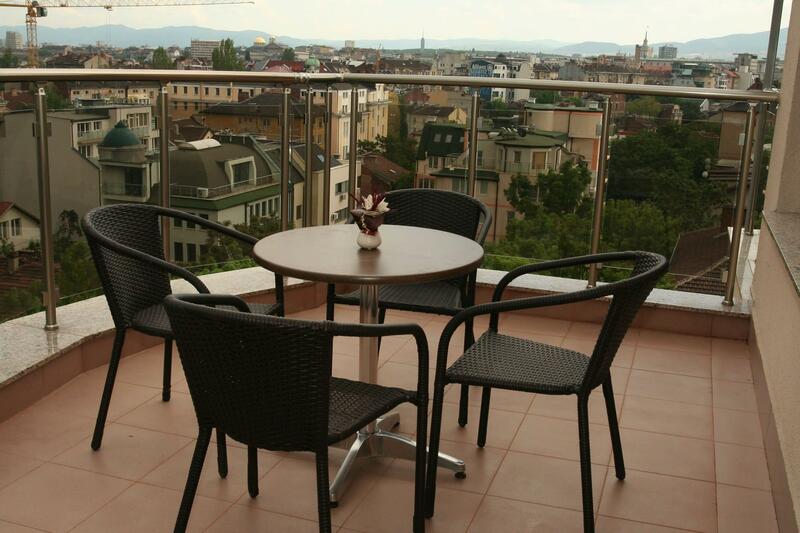 There are 2 panoramic terraces with tables and chairs. 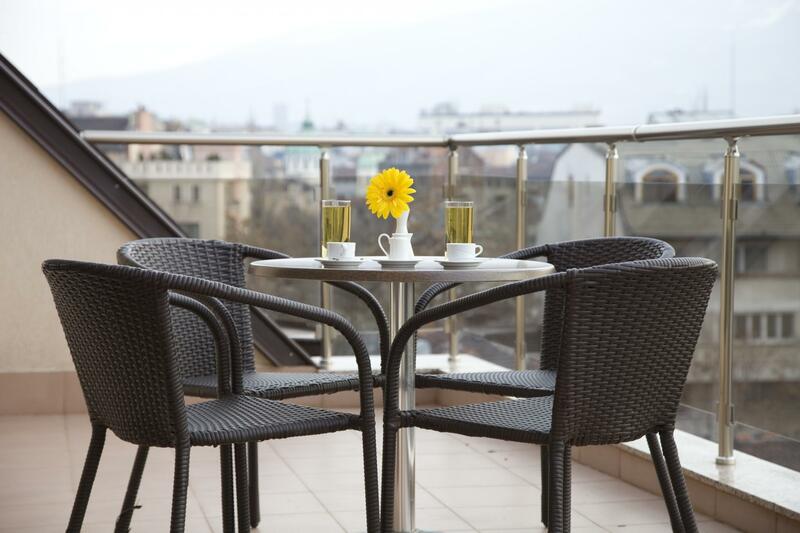 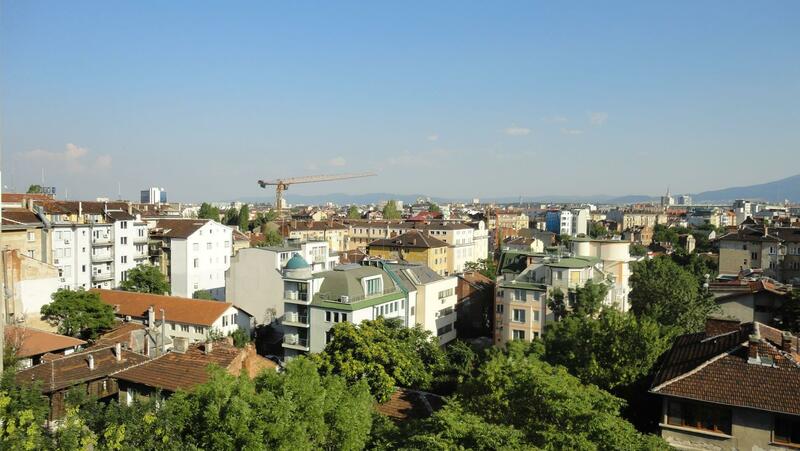 On the large one you can have a meeting with friends or just relax in the open air and take in the beautiful view of Sofia. 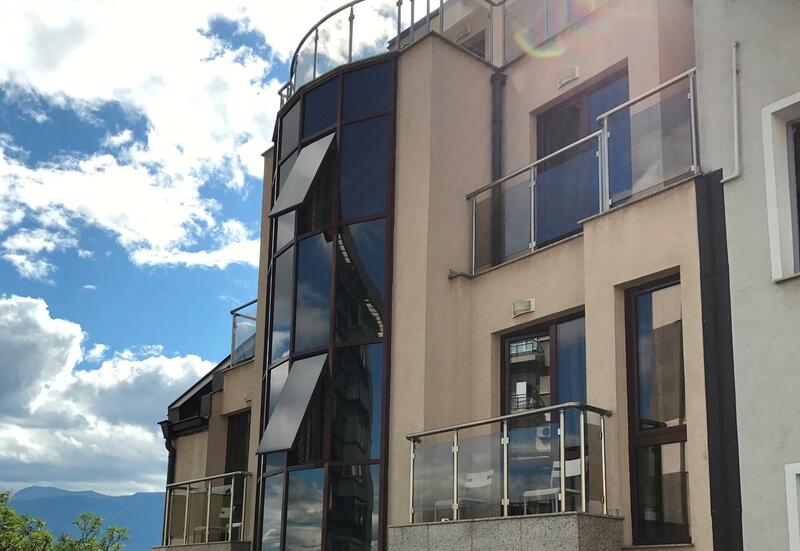 The sole suite on the top floor, surrounded by terraces on all sides, the Panorama suite will take your breath away with its spectacular panoramic view of the city and Vitosha mountain. 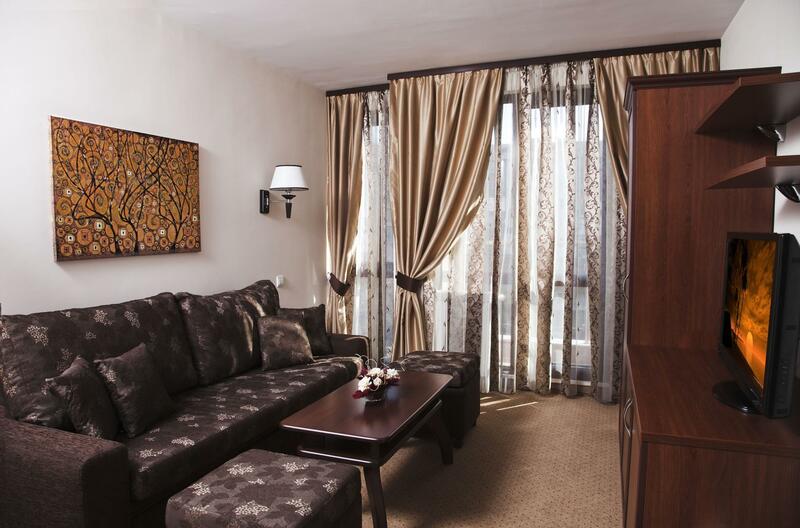 Excuisite and unique, with a neat bedroom and a cozy section with upholstered furniture in the living room, it is as if this suite was made for your special occasions. 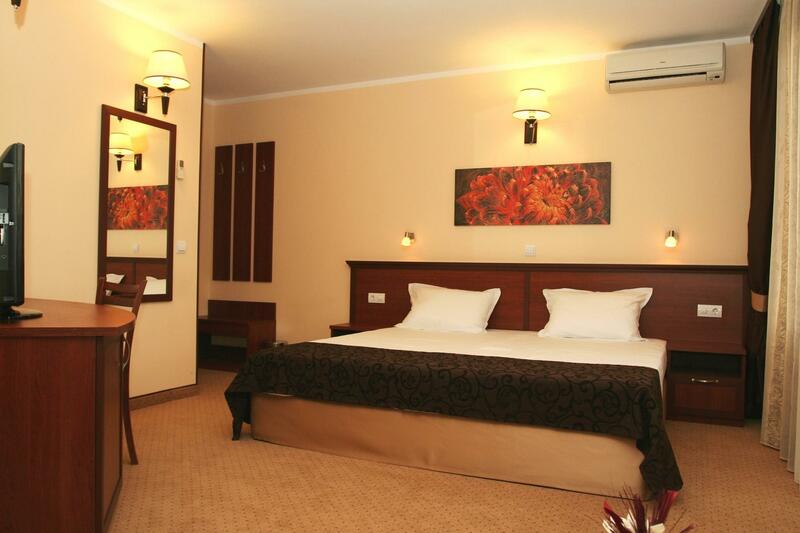 Here we can serve you a breakfast in bed or a delicious dinner by candle light. 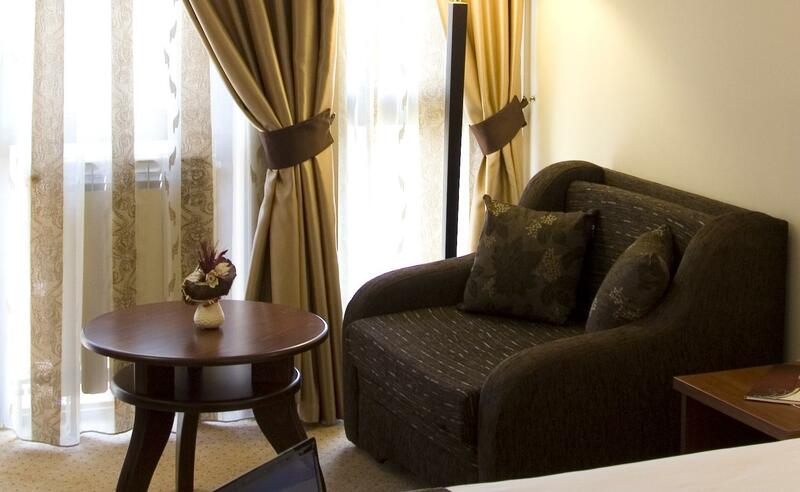 And to make your stay even more comfortable, the suite has a well-stocked mini bar, wide-screen LCD TVs, a dining table with four chairs in the living room and tables with comfortable chairs on the terraces. 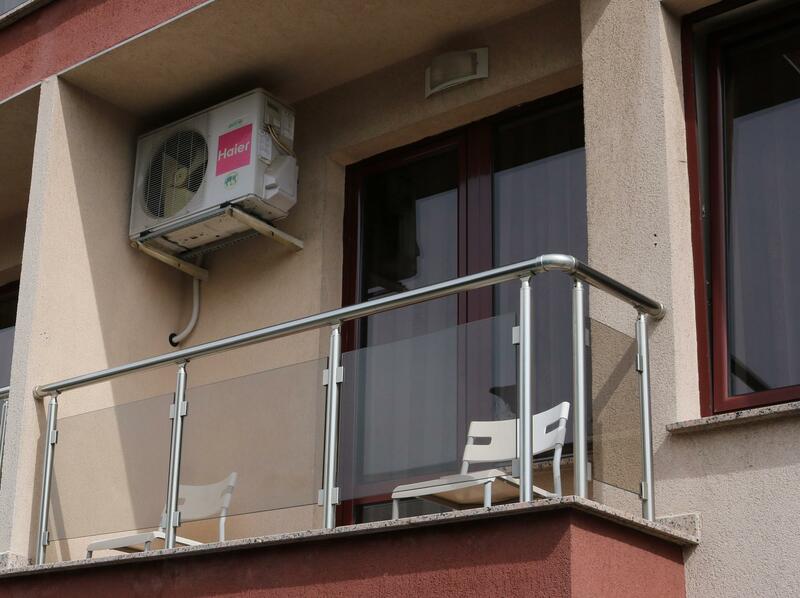 Of course, we have not forgotten your Internet connection, direct telephone line, air-conditioning and electronic locking system on the entrance door.